Masters of Chaos by David Hambling is the fourth book in the Harry Stubbs series and it goes without saying that I am a huge fan of the series. David’s Mr. Stubbs is a man of simple means, striving to better understand the world. This is more than the world as normal men and women know it, although he is constantly reading and taking correspondence courses to increase that knowledge, but also the darker and more sinister works first described by H. P. Lovecraft. To that point, Harry had found himself in the “employ” of an American named Ms. DeVere. She had recruited Harry to investigate the of happenings of Norwood. Harry is only barely qualified for this role through his past run-ins with Lovecraft’s mythos and his history as a former successful boxer. Master of Chaos did something I didn’t expect a Stubbs novel to do, although I should have, and thrust our hero into an undercover role as an orderly at an asylum. While I hadn’t expected it, it fit well with the evolution of Harry’s investigations and made for some amazing scenes and great literary art as the reader who, four books in and well versed in Stubbs’ adventures, questions along with our hero whether or not he’s lost his mind. My favorite part of this delightful tale was easily the part regarding the time Harry received in the first book. When you read it, you will know what I’m referencing. It’s difficult to say this was my favorite part, because I had so many and always enjoy a good yarn of my favorite boxer, but I’m a simple man. 5/5 stars for the Norwood Titan! Normally, I have mixed feelings when it comes to anthologies. It’s not that I don’t like them, my problem is quite the opposite. I love them, but once I get to the point in an anthology story where I want it continue divulging the secrets it’s only just now begun to show me is when the story ends and we shift gears into an entirely different story. I feared that would happen with The Gods of H.P. Lovecraft, but I wanted to give it a try anyway because I’m a huge fan of Donald Tyson’s Necronomicon books and knew that he had written the descriptors of the gods between each of the individual stories. I was pleasantly surprised to find every story in this anthology pleasant to some degree. I still suffered, especially at the end of tales such as A Dying of the Light by Rachel Caine. This anthology was well put together, in that it introduced new tales with very beautifully written takes on the different beasts of the Mythos, while still making itself a primer for each of them. It works well as an introduction to the Mythos, or as a database to update your knowledge if you’re fairly involved in the lore, but haven’t had the time to read any of the Clark Ashton Smith stories (for example). That leads me to my favorite bits. I haven’t read much of Clark Ashton Smith, but I’ve read some and have only really read the Wiki page for Tsathoggua. With that being said, one of my favorite stories from this mix was The Apotheosis of a Rodeo Clown. This story was one of the few that left me begging for it to continue, as it ends with some revelations about the main character that I think (I need to read CAS to be sure) harkens back to the original Tsathoggua tale. On the other side of that coin, my other favorite stories were Dream a Little Dream of Me (Jonathan Maberry), In the Mad Mountains (Joe R. Lansdale), and Down, Deep Down, Below the Waves (Seanan McGuire). In the case of Dream a Little Dream of Me, we got some great pulp adventure while expanding on the Dream Lands and the Night Gaunt Mythos. In the Mad Mountains seemed to create a new interpretation of the Mountains of Madness, while also creating an absolutely horrific tale. Down, Deep Down, Below the Waves was simply great Innsmouth story telling and kept me on the edge of my seat. I didn’t know who to cheer for and that, in itself, was somewhat horrific. At the end of this book, I was left craving more, so much more and encourage everyone to pick up a copy. This was a 5/5 star anthology. A Great Andrew Doran Review! Special thanks to Adam for this great review! In the vast majority of stories set in the Cthulhu Mythos, or within the broader genre of Lovecraftian or Cosmic Horror, it is a trope that if any character – whether protagonist, antagonist or some part of the supporting cast – comes into contact with a being from the Mythos, or any of the magic that comes from the void between dimensions that said beings inhabit, then there will be an incredibly high price to pay. That price is usually something to do with one’s sanity being slowly (or rapidly) peeled away as the true face of the uncaring cosmos is revealed; a soul being corrupted or completely destroyed; or, at best, some combination of the two that doesn’t happen immediately but is cursed to haunt the character until their shortened and untimely death in the near future. That’s all well and proper, and such an intrinsic part of Lovecraft’s writing, and the genre that has expanded upon his writings, that I would be concerned to see a story in the genre that didn’t include it; it wouldn’t be a Cosmic Horror story, or something inspired by Lovecraft. However, I must admit that it is nice to see a piece of Mythos fiction that features a protagonist who is fully aware of the myriad dangers of the void, but who is still skilful and disciplined enough to be able to effectively wield those powers without immediately turning insane or being mutated into a fleshy blob that can only scream telepathically. Sometimes it’s a good thing to buck the general trend of a genre, as long as it’s actually done properly – an excellent example is the Midnight Eye series of novels by my favourite author, William Meikle, which features a Glaswegian private detective who becomes embroiled in Lovecraftian shenanigans and can occasionally pull off a success without his mind being irreparably shattered. Another great example is the book that I’ve just finished reading, and is therefore the subject of this review – The Statement of Andrew Doran by Matthew Davenport. The titular Doran is a professor, mythologist and occultist who divides his time between studying various elements of the Lovecraftian deities and the cults who worship them, studying forbidden texts to understand the basis of the evils done by the deities, and fighting anyone foolish enough to try and use them for evil. He’s a fantastic creation, unashamedly in the style of iconic and archetypical adventurers such as Indiana Jones – someone not afraid to use guns, swords and his bare fists at times to fight foes trying to end the world through Lovecraftian means – not to mention a hefty dose of void magic when appropriate. Set in the early 1940s during the Second World War, with the United States on the brink of joining the war against Germany and Japan, The Statement of Andrew Doran sees the professor pursue the Necronomicon when it is stolen from Miskatonic University by agents of the Nazi regime, fighting his way across Spain, France, Switzerland and Germany in an attempt to stop the nefarious Traum Kult from unleashing the apocalypse on Earth. Fast-paced, action-packed and extremely well-written, by the time I was half-way through the novel I was enjoying myself more than I have in quite some time. Because while we get fantastical, almost cinematic action sequences (a fight against undead Nazi soldiers while fighting through a heavily-armed convoy is a particular favourite of mine), and some of the genre’s obligatory dream-like sequences where entities such as Cthulhu are witnessed, there are also some intriguing ideas ventured by the author. For example, the Necronomicon is stolen by the Nazis from Mistaktonic University at the beginning of the novel, and there’s an interesting relationship between Doran and the university administration that’s really only hinted at by Davenport. I rather enjoyed the idea that the senior faculty left the dreaded, forbidden tome on open display for students to read, in order to see what they would conjure from the book and they could take advantage of once the unfortunate student was driven insane or killed. 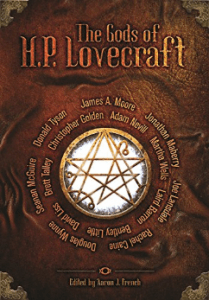 Davenport also weaves together a number of genre archetypes, such as creatures, cults and deities, to evoke a world in which the theft of the Necronomicon, and the desperate efforts to get it back, are merely on plot amongst many being undertaken by cultists and other groups and individuals. This is brilliantly illustrated by an early section set onboard a trawler heading from the United States to neutral Spain, with Doran encountering some oddly fish-like men who are guarding a mysterious set of packages heading for the Spanish coastline, and having to disrupt their plot in order to proceed with his journey. Cheerfully pilfering the best and most exciting elements of the genre – the Necronomicon, Cthulhu, Herbert West – and deftly bringing them together, Mr Davenport has written a fantastically pulpy, fists-swinging, guns-blazing, magical lightning-hurling action-adventure that readily proves that not all Mythos tales need to be grim, foreboding and often achingly depressing in order to be successful or authentic; Davenport shows that it is possible to use all of the tropes of the genre, and be faithful to them, while still producing an incredibly enjoyable adventure. The Statement of Andrew Doran is a credit to both the author and the publisher – once again the fantastic Crossroad Press – and I cannot recommend this heartily enough; I greatly look forward to reading the sequel and any other books that come in the series. When I was a boy, my parents took me to the movies. This was back when we had no money. No money at all. We had to fight to get food on the table and we were always strapped. Well somehow, my parents found the money and the time to take us to the movies, and I saw Sleeping Beauty. I don’t remember much at all. Colors, I think, is all I could take away from it. I was about six and I had no recollection of the story or the images really, but I do remember very distinctly the dragon. I remember the colors, the breath, and the black. I remember this tiny man striving to fight it, and the way it seemed impossible. I remember thinking no force in the world could rival a dragon, and that is all I took from it. Years later, I was watching TV in the morning on a Saturday, and I saw Bilbo Baggins take the first steps of his journey. The artistry of it consumed me, the way those particular animation artists moved the characters across the screen. They were the same animators that did The Last Unicorn and I will never forget the way they drew the line. The movie The Hobbit was fun until Bilbo and I found ourselves at the feet of Smaug. So huge that dragon was, nothing Bilbo could do could ever stack up. There was no weapon to grasp to bring death to that monster. No hope, however slight, could be held when the idea of fighting that beast was at hand. I do not accept the death Tolkien gave to his god of dragons. It is too convenient, too simple. No one arrow ever made could take down the beast I saw in that cavern, no matter how well shot, no matter the target. I remember thinking if ever a power could exist that could rival a being that great, it would have to be me who found it. No other creator could reach within and pluck out the shred of hope that stood up to a creature so mighty. Well, of course, I was wrong. Writers and artists have been killing dragons as long as dragons have been around. St. George cast one down centuries before I was born, and people have been doing it ever since. But Smaug stayed supreme in my mind, a creature of such immense power that no one dare stand before him had they not a ring of power. So then I set to work. I began, time after time, crafting a hero or heroine strong enough to crush the monumental monsters of my mind. Soon wizards. Then warriors. Then one after the next, I began to put together an army of people and beings so invincible that they could stand up to Smaug. They could face the Nefarious, the Tempest and the Wrath of the greatest forces of darkness that any mind could find. Any mind anywhere. With this devotion to craft and heart of a creator, I plumbed the darkness within my mind to find magic. When I hit teenage years, I wanted warriors. Arislan, Aragorn. Caramon Majere. I found Mycenae Kark and Sai Sibbius Summerstone. One after the next, I sought and found one swords smith, then another, to battle the monoliths of my mind. Twenties found assassins. Thirties, barbarians. One great hero after the next filled my mind, always with one goal in sight. Pulverize the immense. Bring down the invincible. I write high fantasy. If that means I am not grimdark, then so be it. There is a boy in here, deep where no one can find him. He is fighting a monster, a monster deeply rooted in the fiber of his mind. That little boy will not let me go small. He has a nemesis. He has a nightmare, and one after the other, he will pump out the mighty and the brave to bring it down. I have never killed Smaug. He is, as far as, I know unkillable. But Rayph Ivoryfist would get close. Smear Kond could sneak up on him. Dreark would make Smaug tremble. I fear that somehow the mighty, world-moving powers within my books will make me less grim, that I might lose some street cred. I might have readers who shrug and drop me, thinking they want lower fantasy than I am prepared to give them. To them I say, please forgive. There is a monster in here. He scares me. I must fight him the best I can. Smaug is watching. Smaug is waiting. Jesse Teller is the author of book 2 of the Manhunter Series: Hemlock. You can get Hemlock here and book 1 (Song) here! A Great Broken Nights: Strange Worlds Review! Charles over at Booknest.eu had some really awesome things to say about the newest installment of Broken Nights, Broken Nights: Strange Worlds! Superhero fiction is a niche genre in a niche genre. Superheroes thrive in comic books, video games, and movies but aren’t so very popular in prose fiction. Perhaps because it’s such a visual medium but I think it’s more there’s just never been an iconic example of the genre. Despite this, there’s some truly great examples of superhero fiction which I’ve been proud to review. Things like Wearing the Cape, Origins of a D-List Supervillain, Soon I Will Be Invincible, and Villains Rule. Broken Nights is one of those series. Is it Citizen Kane? No, but it’s a great book which has created its own superhero universe and is slowly building it up to be something huge. In the previous book, we had Jason Night try to become Darden Valley’s answer to Batman only to accidentally stumble onto a plan to take over the world. Succeeding at extreme cost, he’s only now just recovered six months later–only to find out he’s unwittingly inspired an endless stream of superpowered copycats. Thanks for the Great Review, Charles! While Healer of Surflex isn’t my usual read, the pleasurable voice of Kelly Montijo Fink made the audio a fun time. Healer of Surflex is hard fantasy, with a story rooted in a world of magic and warring factions of good and evil. Most of the populace isn’t aware of the battle for their very souls, but it’s happening. 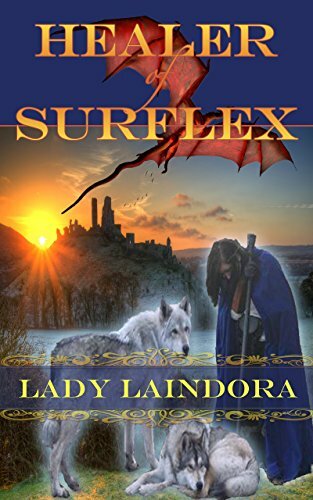 Having not read a lot of fantasy, I have read some, and what makes Lady Laindora’s book unique is that I’ve never seen a fantasy book that incorporates Christian beliefs into a fantasy realm. Doing so makes this more like an Arthurian legend, minus Arthur. The book follows Kerlia as she’s selected, birthed, and trained by an angel and the warriors for good to be a healer in the upcoming battle with this book’s version of Satan, Kernel. Kernel has control over a large portion of the Kingdom of Surflex, and the book is filled with people being possessed or warped and twisted by their beliefs and support of Kernel. Honestly, in the first chunk of the book, the way that some of these people get twisted and filled with such dark evil makes it look like a contagion of belief, and solidifies how Kernel must have taken hold. Lady Laindora’s strengths are in her ability to show and not tell. The protagonist, Kerlia, is mute and a lot of the book is explaining how she interprets the world and how she communicates without dialogue (and sometimes with, when she is part of the fairy realm). There are character descriptions that become part of the story’s narrative, and locations that are described the same way. She does a great job of describing things without you realizing that she’s describing them. Healer of Surflex, and a lot of it’s aspects, remind me much of The Sword of Truth series, by Terry Brooks. The fairies and pixies that train her even reminding me of Zed the old wizard. They are funny but with purpose. At the same time, the style of the fight against evil gave me a feeling of Eragon with less dragons. Finally, there’s angels, God as we know him, and others aspects of this book that have a strong Christianity bend. This is epic/battle fantasy with a theme, and it is done very well. First Draft of Satan’s Salesman is Complete! I originally had the idea almost two years ago as a kind of joke with author Kathryn Daugherty, who’s sales pitch for her books is “A penny from Heaven.” When we sat in booths near each other and I would see people ignore her and keep walking, I’d say “It’s better than a Dollar from the Devil,” and rarely guilt anyone into doing anything. While in another really boring sales meeting at my former employer, I had the idea that every sales industry is kind of the same, and they probably all have to deal with the same issues, from boring meetings to cold call rejections. That thought led to the humorous idea of a man who’s part of the Soul-Trading industry and Satan’s Salesman was finally conceived. Well, the first draft is done, and I couldn’t be happier. Here’s the synopsis. If you want to be a beta reader, comment and I’ll email you an unedited first draft to let me know what you think. Expect one HELL of a Deal! Shane’s a damned good salesman, but when a promotion that he spent years earning gets taken away only hours after getting it, he realizes that sometimes it doesn’t matter how good you are at what you do. But that’s not good enough for Shane. At Perdition Investments the products are whatever you want the most, but the cost is your Soul. Shane has a chance to use his excellent skills in an entirely new way, but at what cost? Can you lose your soul by trading people for theirs? What’s the price for success? All the way back to when the Jetsons met the Flintstones, and every dang Scooby Doo special, I’ve always loved a good Crossover. Most recently, the CW Superhero shows reminded me how much I love Crossovers. Crossovers are great because they mean that no longer are there no consequences in a story. The story is unequivocally effected by having the rules of each story’s world suddenly become part of their own. I find it exciting and fun to know that the sandbox the creators are playing in is so much bigger. A beach more than a sandbox. This love of Crossovers was reignited with a fury when I heard that the new Supervillainy book by C.T. Phipps was going to include a huge Crossover of all of his written worlds. Unlike all of those other Crossover stories, though. It doesn’t open with an even breakdown from every one of those separate worlds. We get a Phipps Crossover in the best way that we could: From Gary’s point of view. The story’s plot is pretty straight forward. There’s an orb that will allow anyone who possesses it one wish with absolutely no limits. Since all realities could be effected by a wishing device with no rules, Death’s first champion, Entropicus put together a Tournament for champions from each reality to duel for the right to win the magical orb. Entropicus’s goal is to win the orb for himself so that he can end all things. Death doesn’t like that and sends her newest champion, Gary, to try and win the tournament. Things go crazy from there as Gary starts to meet all of the other characters from other works of C.T. Phipps, including Jane Doe, Agent G, and Cassius Mass. While I would have liked to see John Booth from the Cthulhu Armageddon series, John has already shown a propensity for being woven into the very fabric of the multiverse, and I understand leaving him out to preserve the integrity of his potential universe hopping. I digress. The plot surrounding Gary and his crew of misfits isn’t derailed by the Crossover event so much as enhanced by it. Gary’s wife Mandy is acting really off and it’s got Gary a little concerned, but he’s too busy to deal with it as his other wife Cindy and his new/old girlfriend, Gabriel, also known as Ultragoddess, are also in the tournament and everything seems to be going to hell. People are getting killed, their new friends want to steal the orb, and everyone is terrified about what will happen should Entropocis get the orb. All of this is happening while Gary debates whether or not he has the right to bring people back from the dead who have already died. In the world of comic books, returning from death is a common occurrence, but just because someone can do it, doesn’t mean they should. It’s a question that has both philosophical and real world consequences depending on how he, the chosen champion of Death, chooses to answer. And of course, the best part of any Crossover, the interactions between characters from other worlds were spot on. Agent G’s realization that his cyberpunk world isn’t the greatest while Jane Doe’s deer puns contagiously cross universes. Then there was all of the drama around Cassius Mass and … wait … how does he know Mandy? This story had everything in it that first drew me to the Rules of Supervillainy series. From the pop-culture references to the kickass action scenes to the emotional moments that make you empathize with someone who continually fails at being a supervillain, but is a damned awesome anti-hero. Add in all of my favorite characters from other Phipps books and you have the perfect story. The perfect Crossover. This was a 5 out of 5 book. Definitely give it a read. A great interview with writer David Hambling! David Hambling is an author and science/technology journalist based in South London. He writes for New Scientist magazine, The Economist, WIRED, Popular Mechanics, The Guardian newspaper and others. 2018 will see the release of “Master of Chaos”, fourth in the Harry Stubbs series of Mythos adventures, as well as the nonfiction “We: Robot – The robots that are changing the world” …both of them are pretty scary. InThe Elder Ice, Harry, a former heavyweight boxer and sometime debt collector now working for a legal firm, is on the trail of a valuable legacy left by Ernest Shackleton (a real-life polar explorer from Norwood). Shackleton died in 1922 leaving huge debts, and also hints of a valuable find; Harry is looking for the reality behind those hints. I went into this book pretty excited. The premise sounded like a lot of fun, and I liked Mamatas’ The Damned Highway. Unfortunately, this was a 3 star book for various reasons that only managed to get its fourth star from me because I did find myself regularly compelled to continue turning the page just for the murder mystery plot. Unlike other reviewers, I mostly enjoyed the protagonist, Colleen Danzig. The parts that bothered me revolved around the victim’s point of view. Originally, those chapters were very entertaining and promised a very Lovecraftian answers. I felt that the story never delivered on those answers. Once again, the murder mystery plot was very good, and felt like an homage to Poirot or Sherlock. What Mamatas did, and what I think makes me uncomfortable enough to lose enjoyment during this novel, was write a novel aimed at the very specific audience of the Lovecraft crowd, and then use that sniper focus to shine a jaded mirror on that very same crowd, all while stating very plainly in that reflection that they are all whiney and opinionated enough that if they complained there would be no validity to their man-baby cries. My question is why someone would pick a target audience to write to and then insult it. The answer, that I suspect, was that Mamatas was going for realism, but from the point of view of a fan who was tired of his fandom’s more negative people. If you’re a fan of Ghostbusters, Star Wars, or just about any series that’s been rebooted or sequeled in the last few years, than you’ve probably experienced similar feelings. You want to enjoy the medium, but when you go online, have a conversation with someone, go onto a Facebook group, or actually go to a CON than you’ll run into so many people that are adamantly argumentative about things you thought were just fun. You can see this also in Mamatas’ mention of the Indie Author crowd. He brings up how getting found doesn’t mean anything other than a few more bucks and maybe a movie deal that won’t ever happen. How everyone with a pen makes an anthology or a publishing house. He complains from the perspective of someone who’s tired of hearing everyone else complain. And he gets kind of mean about it. I get it, there are a ton of stereotypes regarding the fans of Lovecraft, and honestly, I’ve never attended more than one convention-styled event, in a guy’s basement, filled with some of the stereotypes described in his book. The problem was that this book comes across as an angry “letter to the editor” about the fandom, his dislike of the conventions, and the people that he’s been stuck at his author booths talking to. As if he wrote this on a grumpier day in his career. Wow, that’s just bleak as Hell. But the plot for the murder mystery was great. There’s a great story in this book and for that alone I think this novel deserved praise. Mamatas obviously wanted to put forth a good story. It’s just unfortunate that his good story got mired in his hate letter to his fans.